This post was first published on Anne L. Murphy’s personal blog. Are you working against the clock? Struggling to make that next deadline? Operating in an environment of presenteeism where time at your desk counts for more than your actual productivity? In a recent Radio 4 programme, Emma Griffin blamed industrialisation for the tyranny of the clock in our working lives. Eighteenth-century factory owners like Samuel Greg of Quarry Bank Mill made their fortunes by regulating the working day and extracting long hours from their workers. In doing so they transformed the lives of their employees and created a seemingly unbreakable link between time spent at work and perceived productivity. Yet we can’t blame industrialists for this change. By 1783, the year Samuel Greg founded his mill, the City was already working to a rhythm that depended on strict adherence to clock time. In that year, the Bank of England appointed a Committee of Inspection to report on the way the institution worked. In the report we find constant references to the clock and to the timely delivery of the services the Bank provided. The report tells us that the official working day started at 9 and, when the more than 300 clerks employed by the Bank arrived, they found Matthias Alcock, the chief door-keeper, waiting to check off their names. He drew ‘a line every day about 10 minutes after 9, to mark the names of those who do not come to their time’. Some offices were supposed to shut at 3 in the afternoon, others at 5pm but many men found themselves working late into the evening to ensure that records were updated for the start of the next business day. Like many modern workers, eighteenth-century bankers stayed at the office until the job was done. They also ate lunch at their desks when the work piled up. The clock defined every aspect of work. There were deadlines for tasks performed throughout the day, week and year. The clerks had to coordinate their tasks with those of their fellow workers. Indeed, we can think of the Bank as a large factory in which each clerk undertook specialised tasks and synchronisation was required to achieve results. One reason for undertaking the Inspection was to improve that synchronisation and make the work more speedy and effective. And this wasn’t a new thing. The Bank had time-based rules for working from the very early eighteenth century. The clerks could not forget their obligation to the clock, nor could the public who used the Bank. Time was very visible. There were clocks in every office and in the public areas. There was a large clock outside the entrance to the Transfer Offices where the holders of public debt came to register their purchases and collect their dividends. The Bank did not operate this system in isolation. Time is money and that has always mattered in the City. Walk around the streets in the Square Mile and note how many clocks there are on the buildings. As it does today, the eighteenth-century City operated to a rhythm and the Bank’s report shows clearly the interconnectedness of time across different institutions. The brokers and stockjobbers were at the Bank in the morning to see their business done. The notaries came in the evening to check records had been updated. Customers complained if they had to wait for service and would sometimes ‘go away to Bankers to have their business done with less delay’. This expression of impatience is key to understanding what drove the Bank to manage its workers’ time. It needed to keep its customers happy. What did the City’s workers think of their environment? E. P. Thompson argued that eighteenth-century employers thought their workers had a high preference for leisure and resisted the tyranny of the clock. The Inspectors at the Bank certainly found this of the senior men. Management tended to disappear by mid-afternoon! They left the Bank to the ‘vigilance & honesty of the Junior Clerks, (frequently such as are very young in Office)’. But the junior clerks worked hard and they knew how to use time as a weapon and a tool. The Inspection uncovered a dispute between Mr Vickery, a manager in the Transfer Office, and his subordinates. In the discussions that followed both sides used accusations of laziness, inattention and tardiness to discredit their colleagues. But the clerks in the Accountants Office turned the Inspectors’ interest in clock time to better account. They used it as part of negotiations to secure an agreement that they were paid ‘very inadequately to the additional trouble & labour bestowed by them in doing this Business’. It’s clear that the clerks’ aim here was not to secure greater leisure time but to ensure that their labour was sold at fair value. This tells us that while eighteenth-century factory owners struggled to get their employees to accept the tyranny of the clock, the City’s workers were already thinking of their time as a medium of exchange and acknowledging it could be bought…for the right price. If you want to know more, my article published in Past & Present (no. 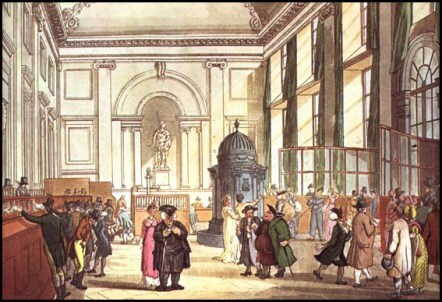 236) ‘Clock-watching: work and working time at the late-eighteenth-century Bank of England’ is available open access.